ARGO: Go In Augmented Reality? A team of researchers from UCLA and Osaka University are developing a way to learn go with “augmented reality” goggles. 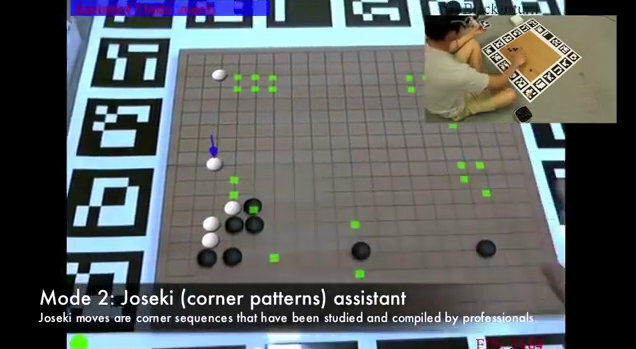 Players using an actual physical board will “see” highlights on certain intersections as the game proceeds in real time. Check out the Youtube video to see how it’s supposed to work. The authors – S. P. Chuang at UCLA and Kikoshi Kiyokawa and Taruo Takemura at Osaka University – believe many beginners get discouraged because it is hard to apply lessons from books on the real board in actual play. On the other hand, computer play lacks the aesthetics of placing real stones on a real board, which also deepens the learning process. ARGO aims to integrate the best aspects of “real” and “virtual” experience. The video illustrates four functions. “Fuseki Tutor” uses Kombilo to search a database of 80,000 professional games, identify moves that pros have used, and “project” them onto the board, while “Joseki Tutor” uses Kogo’s Joseki Dictionary in a similar way. As play moves into the middle game phase, “Go Engine” mode allows the player to connect with an open-source program such as GNUGO or Fuego for next-move recommendations. ARGO can also attempt to count the game and provide estimates of the current “score.” The authors also claim that ARGO enables online play with a real board by transmitting the player’s next move to the server. At first glance, ARGO appears to set forth on a potentially promising path. We’ve all encountered and experienced “bewildered beginner syndrome,” in which new players have no idea what to do next. A few recommendations can help to move the game along so that protracted helplessness does not become part of the experience. In years to come, players may look back on ARGO’s little green dots as we now recall Pong and the Commodore 64 — quaint relics of a primitive era. One can easily imagine color-coding good moves, best moves, pitfalls, trick moves and so on. Future players may “right-click” on recommended moves view possible outcomes while a narrator talks them through each variation. For now, ARGO is probably mostly of benefit to new players by providing them with specific options to think about. Cynics may say that ARGO also makes it easier for players to “cheat” with a program that is stronger than they are, especially online, but anyone with two computers can do that already. Unfortunately, the 60 MB download does not seem to include easy instructions; and of course one would need a pair of AR goggles. Nothing has been posted or revised for several months and we were unable to reach the developers for comment, so it is hard to know whether this project will move forward or remain “vaporware” for now .Visit Chuang’s Github site for the latest information.